Twenty-five years ago today, an ambitious title was released in Japan that would, in time, become one of the biggest and most important franchises in video game history. That game was The Legend of Zelda. While it may look crude now, it's easy to forget that, at the time of the game's release, it was the Oblivion of its day, its inter-connected worlds and dungeons being so huge relative to other titles that it would be the first NES game in the West to need its own internal battery so users could save their progress. This scale and open-ended approach to game design - with players able to progress through the game in a non-linear fashion - made it a smash hit. By the time the original cartridges (or disks) were finally taken off store shelves, The Legend Of Zelda had sold over 8 million copies worldwide. Including the original game's release on the Famicom Disk System in 1986 (for which it was a launch title), a total of 14 unique and "proper" Zelda games (excluding re-releases) have been published by Nintendo for the Famicom/NES, Game Boy, Super Nintendo, Nintendo 64, Game Boy Advance, GameCube, DS and Wii. A number of other Zelda games, some not made by Nintendo and others being spin-off titles, have also been released in that time, while the 15th game — Skyward Sword — is due later this year on the Wii. With The Legend Of Zelda: The Ocarina Of Time widely regarded as the greatest game ever made, and with the series as popular and iconic today as it was back in 1986, it retains a very special place in the heart of many gamers, and for the rest of this week we'll be celebrating that. While Mario is the public face of Nintendo, Link is in many ways its spine, the star of the one series that, no matter how revolutionary the hardware or distracted the company's other franchises become, can always be counted on to deliver a truly epic adventure. After all, of all the thousands of video games I've played over the last three decades, my favourite to this day remains The Legend of Zelda: The Wind Waker. 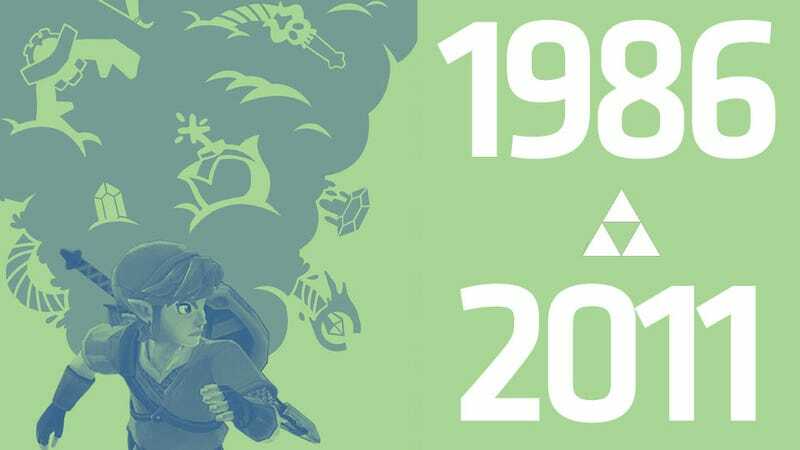 For the rest of this week, Total Recall will be looking back on 25 years of Zelda, with a new piece published each day. Don't expect a straight reminisce about the major games in the series, though. We'll be looking at some of the paths less trodden by Link, Zelda and that sharp-dressed villain Ganon.